Over the years the Church of Uganda has been involved in nurturing children, spiritually and physically, through church ministry, teachers, leaders, and parents. Our children are deeply cherished; many of these adults, including parents, make incredible sacrifices for their children and entire communities look to children for a brighter future especially by taking them to school and providing the necessary support. However, too many children in Uganda continue to be at risk even from the very adults on whom they depend for safety and well-being. 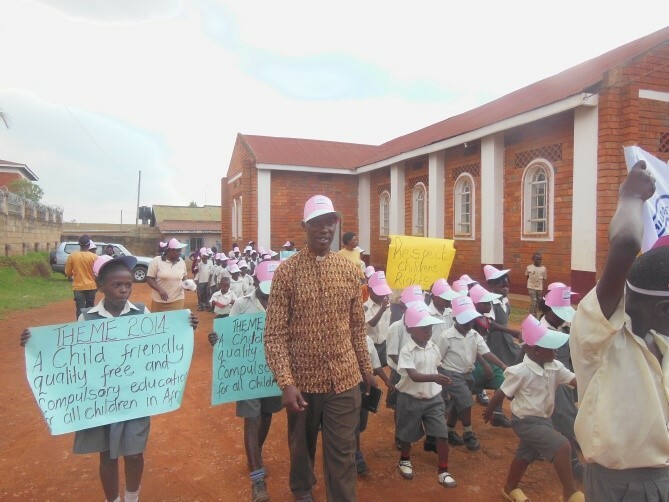 The Education/Children’s Ministry Department of the Church of Uganda believes that the strengthening of Church Structures and Governance Systems to promote holistic quality informal and formal education for children cannot be overemphasised. Now, more than ever before, we have to see better learning for our Children, but how can this be if our children live in unsafe environments? The recent trends in the survival rates in our Education at Primary School level are very worrying. A report by the National Forum on State Education (Sept 2015) indicates that while the Primary School enrolment rate is high, more than 70% of children who start P.1 do not complete the Primary school cycle. In 2013 and 2014, only 30.10% and 32.10% survived to Primary 7 with dropout rates being highest between Primary 5 and Primary 7. Both boys and girls experience low survival rates at Primary School level. The same report suggests that one contributory factor making this statistic unsurprising is that of widespread violence against children. The Uganda Police annual Crime and Traffic reports for 2011 and 2013 indicated that 12,410 and 19,301 children were victims of various offences ranging from neglect to infanticide, with the same reports indicating that defilement cases showed an increase of 30% from 7,360 in 2009 to 9,588 in 2013. As a Co-ordinator, I have had no peace, because each time I am out, I may see a child being beaten, hear a story of a child who has been defiled and read or even watch a story of a child who life is at risk. How can my country expect better? Who is responsible for changing this? These and many more questions are for all the Stakeholders, Leaders, Parents and all Good People. It is a tragic situation. The analysis on Children in Uganda (UNICEF, 2015) indicated that 77.7% of Primary and 82% of Secondary students reported experiences of sexual abuse in schools. The UNICEF 2013 report revealed that 60% of girls and 61% of boys had never reported any case of abuse due to fear of being victimized by the perpetrators. 67% of the perpetrators were found to be male teachers!!!! In Uganda, widespread ignorance of laws against Child Abuse, Violence and Neglect has contributed to the persistent violation of children’s rights in all forms yet such violation remains on the increase. It is very unfortunate that these violations that endanger or impair children’s physical and emotional well-being and healthy development still dominate our societies. Children from all over Uganda, even from families where parents are literate, continue to suffer from abuse, including neglect, emotional, physical and sexual abuse. Teenage pregnancies, child sacrifice and child trafficking are very common stories. Protection and safeguarding of our children is a great need. The Church of Uganda believes strongly that holistic development of each child’s capabilities for healthy physical, moral and spiritual growth – especially in Pre-Primary and Early Childhood Centres – is our responsibility. Currently the Church of Uganda has 13 million members, with over 56% under 18 years of age. Protecting and safeguarding the children is as much our responsibility as it is that of the Family, NGOs, Community and Government. As a faith-based Organization, we must demonstrate our commitment to children by putting in place measures to ensure that our children are kept safe. Our children should grow up with knowledge that they are cherished and protected. One Church objective is to reach children for Christ and facilitate their spiritual learning and growth for Christian witness. This cannot be done as long as the world in which they are living is unsafe. We read in Matthew 19:13f, “little children were brought to Him that He might put His hands on them and pray, but the disciples rebuked them. But Jesus said, “Let the little children come to me, and do not forbid them; for of such is the kingdom of heaven.” Jesus did not just love children, He wanted them near Himself, protected and safe. The Education Department is working to ensure that there is quality Christian teaching and spiritual nurture in Church of Uganda-founded educational institutions. Ensuring accessible, quality, equitable and efficient education service delivery in the Province cannot any longer be left to the Government alone. We must build the capacity of all Church governance and management structures and help the heads of educational institutions to enhance their skills in strengthening a holistic education system in our Schools. The Church must monitor, inspect, supervise and co-ordinate the establishment and functionality of church-founded educational Institutions. My Unit is engaged in developing guidelines and standards as well as equipping and training for Dioceses, Archdeaconries, Parishes and sub-Parishes, Schools and all affiliate Organisations. We have developed and published 2,500 copies of the Child Protection and Safeguarding Policy for the Church of Uganda and over 180 Children’s Leaders and Teachers have already been trained. We have also developed and intregrated the Children’s Discipleship Curriculum, meant for Children at Risk, with Bible truths, character transformation and life skills integrated into our Churches’ and Schools’ learning and over 1,880 Children’s Leaders and Teachers have been equipped. So far 330 School Chaplains have been trained to be the stewards, shepherds and spiritual gate-keepers for students in all our Schools. It is our duty to develop and strengthen safe school environments for all our children so that the situation can change. The will to have our children safe should go beyond the Government to all stakeholders – Parents, Religious Leaders, Judicial Officers and Law enforcement officers. We cannot allow our children to continue fearing learning because of the risks they face. We cannot let the children be treated like aliens in their own country. We cannot let violence and harmful practices keep our young generation from learning. We must have safe schools environments for better learning. Now is time to act!